Mourners cried out in shock and fled after they witnessed their friend, a man named Brighton Zanthe, awake and rise from the dead at his own funeral. 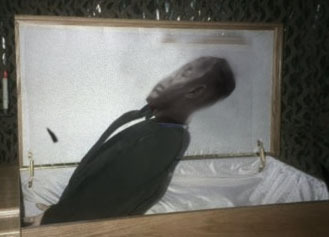 The New Zimbabwe reports that funeral-goers first noticed that Zanthe, aged 34, started twitching his fingers as he lay in his casket. The twitching started as friends and family approached the coffin to pay their final respects. Zanthe then began showing signs of life, struggling to sit up and moving around to regain upright composure. Gaka’s boss reports he saw ‘his legs started moving’ as he tried to escape his casket. Guests at the funeral cried out and fled in panic, many reporting that they feared the man would had come back to life to haunt them. One of Zanthe’s good friends, Lot Gaka, managed to keep his wits about himself and braved seeing his lifelong companion doing the unimaginable. Quickly thinking, Gaka pulled burial sheets from over Zanthe, which let him right himself and sit up in his casket. Gaka then called an ambulance from a distance. Miraculously, Ganthe spent several days in intensive care and then was released from the hospital. Ganthe reports of his ordeal, “I don’t know what happened, and I only remember being on a life support system in hospital.” The 34-year-old succumbed to a lifelong battle with a terminal illness before being declared dead, only to rise again at his funeral.